Why is Kim Jong-un pursuing intercontinental ballistic missiles that would give him the capability of hitting the mainland United States with nuclear weapons? Part of the answer is survival—the United States will not launch a preventive war against North Korea if Pyongyang could retaliate with nuclear weapons. But if that were the only reason, the situation would not be so dire. After all, deterrence worked in the Cold War. Once Kim gets his ICBMs, both sides would be cautious, or so the argument goes. But there is more to it than that. Kim's ambitions appear greater than mere survival. He is a young man who believes he will be in power for another 40 years. The ICBMs are the key to his long-term strategy. He seems to believe that ICBMs will fundamentally change the balance of power in the region by forcing the United States to withdraw from South Korea. Kim may be right. One need just look at the remarkable interview that Trump's former chief strategist, Steve Bannon, gave to The American Prospect two days before he left the White House. Bannon said there was no military solution to the ICBM threat and he favoured a deal in which the United States withdrew its forces (currently 28,500 troops) from South Korea in exchange for North Korea freezing its nuclear program and agreeing to inspections. Kim will have read Bannon's interview with great interest. It reveals the isolationist nature of America First, the foreign policy doctrine that is on the rise in America. US interests are paramount. With an America First foreign policy, the United States will not risk its own security for those of its allies. Gone are the days of the Cold War when the United States was ready to sacrifice New York to save West Berlin or Paris. The United States may not withdraw immediately but over 10 or 20 years, who knows. Kim will surely increase the pressure on America once he has a reliable ICBM capability. He will use conventional force—as his father did twice in 2010 against a South Korean vessel and Yeonpyeong Island— and promise to strike America if US forces respond. The more Americans think he is crazy, the more credible the threat will be. These crises will stoke nationalist sentiment in America and prepare the ground for a deal along the lines that Bannon suggested. If the deal came to pass, it would have a devastating impact on North East Asia. It would raise the risk of a new Korean War. Japan and South Korea would go nuclear. And, North Korea would be very likely to cheat on the deal and continue to pursue its ICBM program in secret so it could deter any American assistance to South Korea or to Japan. This is what's at stake in the current debate around North Korea policy. Officially, the Trump administration still hopes that it can put enough pressure on North Korea to persuade Kim to change course. But, there is little chance of that. North Korea suffered a famine in the 1990s and neared collapse but never changed course. Its economy is in much better shape today. Kim has systemically eliminated high-level officials close to Beijing, including his uncle who he had killed with artillery fire. China could impose more costs on Kim but there is no reason to think he will back down. Rather than putting all its eggs in the sanctions basket, the United States must now turn to preparing for the new era. It must render Kim's ICBM's ineffective for anything other than his survival. It must put unprecedented pressure on Kim's regime. And, it must enlist China's help in doing so. This means making it clear that the United States will not be deterred from containing North Korea, even if it puts the homeland at risk. It means demonstrating that the United States will respond to any act of aggression with a proportionate response. A limited attack on South Korea will be met with a limited military response. If blackmail is attempted, Pyongyang's bluff will be called. The United States will continue to deepen its alliances in the region. It will target the regime's weak points, including in the information space to weaken Kim's hold on power. It should calibrate the pressure on the regime according to how provocative North Korea's behaviour is at any given moment. All fine, one might say, but why would China go along? Containment of North Korea will mean enhanced missile defenses and more US forces in Northeast Asia. It could mean Japan and South Korea acquiring nuclear weapons. 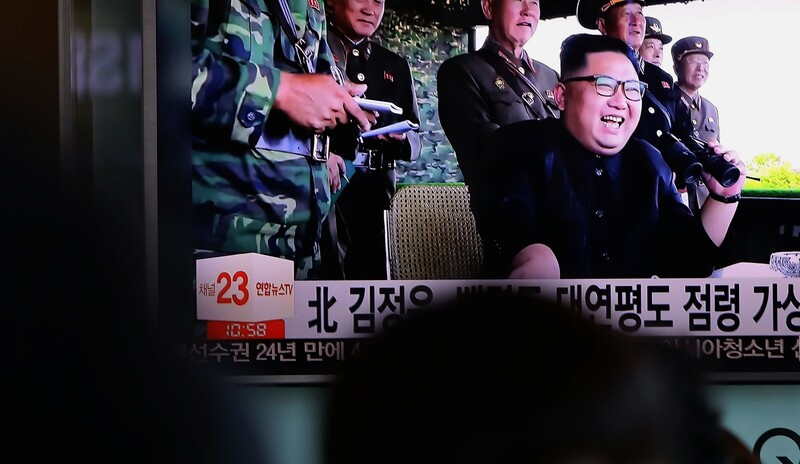 It will also increase the risk of limited conventional conflict between the United States and North Korea as Washington tries to demonstrate that the ICBM's are not the equivalent of a blank check. This means that China's strategic environment will steadily deteriorate. If China plays a part in containing North Korea, it can help shape the response, influence that would be denied to it if it stood on the sidelines. That's China's incentive. Containing North Korea will be a crucial part of America's Asia strategy for many years, possibly several decades. Successive presidents must carry it out responsibly. It will be difficult and dangerous. But, it is better than the alternative of American withdrawal that puts Northeast Asia on the brink of a new Korean War.